NOTE: the houses showed in the gallery are all uninhabited. Anyway some of them are not on sale or available for rent. There are tens of houses ready to be rent or selled and they fit for any kind of demand: little buildings in the old town, ideal for one or two people; bigger houses with large rooms for families; typical habitation with the "lower floor" - used a long time ago as stable and nowadays usable as a functional warehouse or garage - and, upstairs, two or three rooms accessible through the external stairs; buildings placed in the main streets of the town (migrant workers who came back from America own these big houses). The living rooms are furnished of fireplaces and typical domestic furnaces usually used for bread cooking or proper recipes of the arbëreshë cooking tradition. In the neighbourhood there are a lot of farmhouses with attached lands: these kind of combining may be transformed for housing use. All houses are connected to the public services (utility companies): water-supply, power supply, methane, cable television and telephone. There are little gardens and specific kitchen gardens in most of the houses: these are provided by flowers and perfumeries typical of the Pollino area. 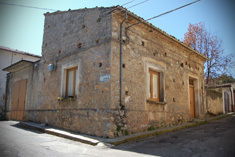 Some houses have got terraces from which anyone may enjoy at the same time the view of the Pollino mountains (on the north side) and the Jonio sea (on the east side). The local craftsmen may attend for the best renovation and modernization works at low prices.